Founded in 2009, 3rd Street Flats is a boutique lodging company in Historic Downtown McMinnville. With eleven uniquely designed apartments in two historic buildings, 3rd Street Flats can host groups of two to six people for as little as a night or as long as they might like to stay. A fusion style of lodging, 3rd Street Flats offers the style and professionalism of a hotel, the hospitality of a bed & breakfast and the amenities of a vacation rental (our official lodging classification). 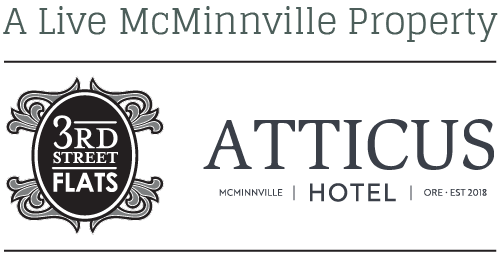 In January of 2010 founder Erin Stephenson and her husband Travis started the renovation of the second story of the Historic McMinnville Bank building (built in 1885), converting four one-bedroom apartments to beautifully inspired flats. Working with four teams of local designers and a terrific group of contractors, each flat was remodeled from top to bottom with an eye for historic detail and a commitment to going green with materials when a new product or surface was required. This process was all captured through a film and competition called the 3rd Street Flats Design Challenge, which allowed the public to watch the process and vote on their favorite transformation. The concept of being able to rent a historic apartment in Oregon’s wine country as if it were a hotel room, which was inspired by Erin & Travis’ experiences traveling through Europe, quickly took off. In June of 2011 they brought on partner Brian Shea as both co-owner and co-manager with Erin. With Brian’s addition to the team, the business continued to grow and by 2013 it was clear it was time to open a second location. In January of 2014 3rd Street Flats began the renovation of seven new flats on the second and third stories of the historic Odd Fellows Lodge (built in 1909), three blocks down Third Street from the original location at the Historic McMinnville Bank. The flats at the Odd Fellows Lodge were designed by two of the original four design teams, and have the same incredible styling, attention to detail, focus on comfort and green sensibility as at the original location. Additionally, five of the flats at the Odd Fellows Lodge have two-bedrooms, and two feature sleeper sofas, allowing a six person occupancy. Since first opening its doors to guests in 2010, 3rd Street Flats has received a lot of positive press. With features in publications like Sunset magazine, 1859 magazine and many more, guests from all over the world have found their way to downtown McMinnville. 3rd Street Flats is guided by a belief that the best travel experience is an authentic one. As such, every effort is made to help guests feel as if they have dropped into life in downtown McMinnville, and can live like a local rather than a tourist for the duration of their stay. As a part of this experience, each flat features local products like Bumblebee Hill Farm soap and has local art on the walls. Guests are also welcomed with a bottle of our own 3rd Street Flats pinot noir (produced by Cultavin Cellars in McMinnville) and two seal salt caramels made by Honest Chocolates in the retail portion of the Odd Fellows Lodge. A two day supply of locally ground Ihilani Kona Fusion coffee is also provided. In addition to local products, 3rd Street Flats partners with a variety of local businesses. Guests staying in the Historic McMinnville Bank pick up their keys at the Bitter Monk, a craft beer tasting room. At the Odd Fellows Lodge guests pick up their keys from local wine maker R. Stuart & Co.
Oregonian’s pride themselves on a love of locally sourced products, but also are committed to green living. As such 3rd Street Flats features many green products, ranging from beautiful Paperstone countertops (100% post-consumer recycled newspaper) to various applications of bamboo, marmoleum and cork flooring. Several of our flats also feature reclaimed or upcycled products.